KirkwoodGolf has been reporting on womens, girls and student golf since April 2002. During that time we have made very many friends and have always been encouraged by our knowledgeable readership. Thank you for your support over the years. The days of websites such as this are numbered. When KirkwoodGolf started, there was no such thing as smartphones, and most people were still using dial-up to get on the internet from home. Finding results was difficult as many organisations did not have websites , and those that did were often difficult to find. We collated the news and displayed it on one screen, later turning it into a blog as it was easier to post news stories that way. Nowadays our social media apps on phones and tablets are looking for a different format, and everyone can share and post golf news instantly with their friends without the need for a dedicated website to provide the service. Your editors are both busy people, with other interests and responsibilities, and finding the time to keep the website up to date has become problematic. For these reasons we have come to the decision to close the KirkwoodGolf website. I'd like to thank Colin Farquharson and Carol Fell, who have made fantastic contributions both in content and support. Without them this website would have closed a long time ago. Colin is continuing his ScottishGolfView website, and a lot of the womens, girls and student golf content will appear there. Carol is going to keep her successful and much-loved Renfrewshire Ladies' County West of Scotland Ladies Golf and West Vets websites going. The KirkwoodGolf website will still be available, and the links down the left will still work, so we won't have disappeared entirely. We've really enjoyed providing "Golf News you can't find anywhere else" to you over the years. 100 Douglas Park Golf Club Lady Members had a a very enjoyable evening on Friday at their Annual social evening held in the Bearsden Glasgow Clubhouse. Belle Robertson MBE who is an Honorary Member of Douglas Park was the guest Speaker. The "Douglas Park Choir" was the "Abba "entertainment which had a Swedish Theme to the night. Sunday’s play teed off in beautiful, sunny conditions and the second-year professional golfer began with two birdies and a bogey in her first seven holes. She kept her five-stroke advantage through the turn, before Katie Burnett birdied the 10th hole to get within four strokes. Then, at 2pm local time, dramatic tropical storms moved through the area forcing the suspension of play for 3.45 hours. Scot Kylie Henry had a great last round of 68 with 6 birdies in the inward 9 to finish on 2 under and 11th place. Singapore, 24 February 2018: Emerging Thai star Atthaya Thitikul, 15, secured a dramatic wire-to-wire victory at the Women’s Amateur Asia-Pacific by winning a four-way play-off at Sentosa Golf Club and securing places in two of this year’s major championships. Continuing to sing, laugh and joke with experienced caddie Roongroj ‘Yod’ Boonsri, Thitikul carded a closing 71 to join Japan’s Yuna Nishimura (69), the Philippines’ Yuka Saso (68) and New Zealand’s Wenyung Keh (67) with an eight-under total of 276 over the 6,456-yard New Tanjong course. After narrowly missing birdie-putt chances to win on the first two extra holes on 18, Thitikul tapped in for par on the long par-four 12th before 17-year-old Nishimura missed a long par putt to concede victory. Keh, 20, and Saso, 16, exited after the first and second extra holes respectively. Thitikul, who only turned 15 on Tuesday, started the event at 53rd in the World Amateur Golf Ranking, with recent highlights including becoming the Ladies European Tour’s youngest-ever winner last July and gold medals in the SEA Games individual and team events in Malaysia a month later. Saturday 24th February 2018: France's Céline Boutier kept her composure throughout heavy tropical downpours to post a five-under-par 67 on day three of the Australian Ladies Classic Bonville. At 11-under-par, the 24-year-old from Montrouge will take a five-stroke lead into the final round ahead of the halfway leader Holly Clyburn from England, with a further four players a stroke back. 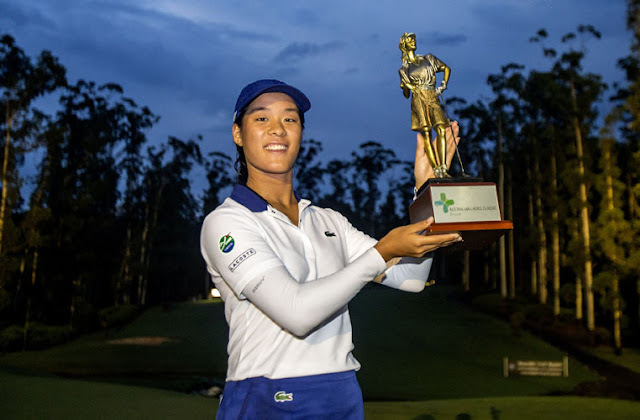 Boutier, who claimed her first Ladies European Tour title at the Sanya Ladies Open in China in November, teed off in light drizzle and promptly birdied the first hole at Bonville Golf Resort, which Clyburn bogeyed to fall into a share of the lead. As the other players struggled in the difficult conditions, Boutier remained unfazed and birdied the fourth, seventh and ninth holes, to make the turn in 31 with a two-stroke cushion. Although she bogeyed the par-3 11th to drop into a share of the lead with Clyburn, the Englishwoman played the next four holes in four-over-par as Boutier birdied the 14th to grab a four-stroke advantage. Both players closed their rounds with birdies on the long 18th as the sun peeked through the tall gum trees on Australia's most beautiful mainland golf course. Afterwards, Boutier credited her caddie, Shane Codd from Ireland, saying: "My caddie helped me a lot to stay dry and that was very important, because when everything is wet, it isn't too easy. I tried to stay in the present, take one shot at a time and I made some good par saves when it was pouring down, so I was playing solidly all day. I'm super happy with the way I handled the course today." Clyburn, who began the day with a two-stroke lead, was disappointed with her third round 74, which included a double bogey at 15, but remains within touching distance of a second LET title. The 27-year-old from Cleethorpes said: "It was a long day. Céline played fantastic out there. I didn't expect her to go out and shoot 67 in those conditions. It was her day. I don't think I've ever experienced rain like that and then, all of a sudden, been so hot at the same time. I thought the course did well considering how much rain was getting thrown down." Katie Burnett of the United States (68), Daniela Holmqvist of Sweden (70), Valdis Thora Jonsdottir of Iceland (72) and Olivia Cowan from Germany (73) all ended on five-under, a stroke ahead of the leading Australian, Hannah Green. Burnett also had an experienced caddie, who helped her to stay patient. "I have a great caddie, a legend, Sophie Gustafson. It's great to have somebody with that much experience out there who can calm you down and make sure everything is set and ready to go," said the 28-year-old from Georgia, adding that she relishes tough conditions. Holmqvist is also known as a tough competitor. Five years, ago, she used a golf tee to remove the venom from a black widow spider bite from her ankle midway through a qualifier for the Women's Australian Open at Royal Canberra, which earned her the nickname 'Spider-woman.' 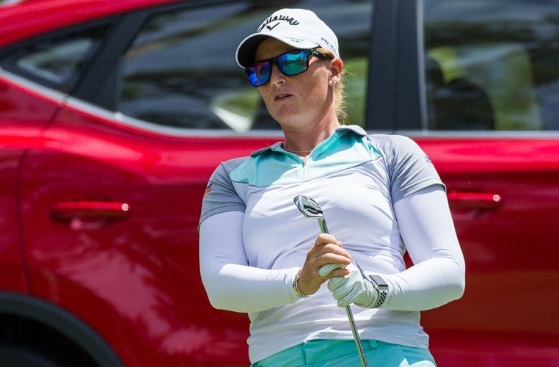 Despite that, she still loves Australia and said it would be a dream to become the winner of the inaugural Australian Ladies Classic Bonville. The favourite coming into the tournament, Green felt that she hadn't played her best, with five birdies and as many bogeys on her card. She said: "I thought it was tough out there. I glimpsed at a leader board on 16 and thought, wow, what course is Celine playing? A 72 wasn't too bad, but I definitely left a lot out there." Another Australian, Rebecca Artis, shares eighth place with Denmark's Nanna Madsen and England's Florentyna Parker is in 10th place. Olafia Kristinsdottir fired a 67, to share the equal best score of the day and lies in a tie for 20th place. Batty said she was "over the moon" to find herself only two shots behind leader Laura Fuenfstueck (Germany) after 36 holes. Fuenfstueck is on five-under par 139 after scores of 70 and 69. Batty has carded 71 and 70. 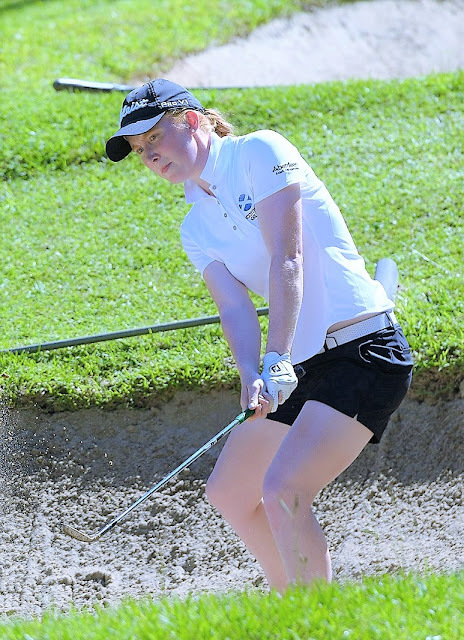 McWilliam, a winner already in South Africa this week - at the Border Women's Championship, has been rock steady over the first two rounds of 71 and 72 for 143. Now she needs to step up a gear and get the birdies she will need to challenge the leaders. Professional Jane Turner from the Lothians is the only other Scot to make the cut with 82-71 for 153, one shot inside the limit mark. Compatriots Hannah McCook (Grantown on Spey) (75-81 for 156) and Chloe Goadby (Stirling) (73-87 for 160) were eliminated. The sensational 2017 season of teenager Lily May Humphreys was recognised last night when she won England Golf's Rising Star Award. She's just 15 years old but she's definitely one to watch and her achievements were recognised at the England Golf Awards sponsored by Bridgestone. Around 500 guests gathered at the Royal Lancaster London to celebrate all that's great about golf in England. 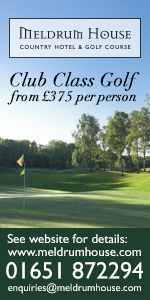 They applauded Lily May, a member at Stoke by Nayland Golf Club in Essex, who won five championships last season, taking English, British, European and American titles. Lily, who started playing golf about five years ago, said: "This means such a lot, I didn't know I was in contention for this." And the secret of her success: "I just practice, enjoy myself and make friends." She was a finalist for the England Golf Performance of the Year Award, alongside Race to Dubai winner Tommy Feetwood; European champion and low amateur at The Open, Alfie Plant; and the England women's team which became European champions for the second year in a row. The Performance of the Year title went to Fleetwood but the judges also recognised Lily May's achievements. "It's only a few years since Tommy was playing in our England teams and was dreaming of future successes," said England Golf Performance Director Nigel Edwards. "We want to recognise another player who is starting out on that path in great style and Lily May receives our Rising Star Award." 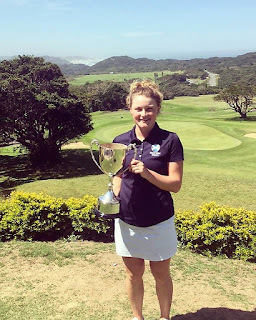 During 2017 Lily May won the British girls' championship, the European Young Masters, the English women's amateur championship, the Sir Henry Cooper Junior Masters and, on her first to the USA, the Junior Orange Bowl Invitational. 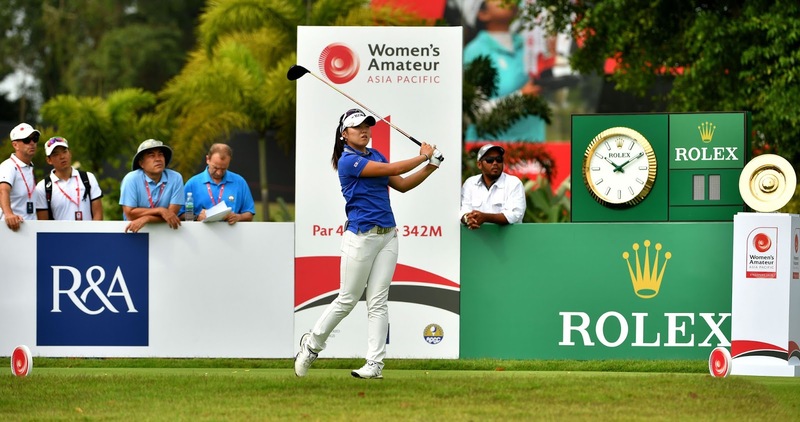 Singapore, 23 February 2018: Korean Ayean Cho, 17, was in pole position at seven-under at the end of a rain-interrupted third day at the inaugural Women’s Amateur Asia-Pacific at Sentosa Golf Club in Singapore. Cho was two-under for the day after 14 holes when play stopped at 7.20pm due to fading light. Action was suspended for most of the afternoon due to heavy rain and the threat of lightning before resuming at 6.20pm. Thai starlet Atthaya Thitikul, also playing in the final flight, was six-under overall along with Japan’s Yuna Nishimura, who was playing in the second-last group and had three holes left to play. Yuka Saso, the Philippines’ top-ranked amateur, made a major move with four birdies putting her four-under after 17 holes and five-under overall, level with compatriot Lois Kaye Go, reigning Japan Women’s Amateur champion Yuka Yasuda and Korean Yunji Jeong, who all had yet to finish their rounds. Friday 23rd February 2018: England’s Holly Clyburn said it was a ‘game of two halves’ after she recorded a second round of 69 to keep her two-stroke lead midway through the Australian Ladies Classic Bonville. The 27-year-old from Cleethorpes carded six birdies and three bogeys on a day of mixed weather conditions at Bonville Golf Resort, for a total of eight-under-par, but it was a topsy turvy round. After making four birdies on the fifth, seventh, ninth and 10th holes, she bogeyed the 11th, 12th and 14th, before finishing with a pair of birdies. “I played fantastic on the front nine and was minus three, but then I had an awkward yardage on 11, which made my round go upside down a bit,” said Clyburn. “I took a three-putt there and got lucky on 12 not to be in the hazard, so I took bogey there and then took par on the next hole. I got shocked by a tee shot on 14, from the girls in front, which made me duff my shot, but all in all, I played some nice golf and I’m quite happy. 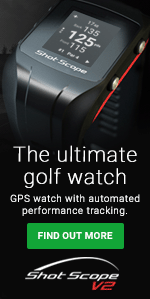 “This golf course will throw some surprises at you, so you’ve got to stay patient. I finished on a high with two birdies on the last two holes, so I’ll keep doing what I’m doing.” Céline Boutier of France and Olivia Cowan from Germany, who both shot 68s, were her nearest challengers, Boutier having posted the clubhouse target of six-under before Clyburn teed off. Iceland’s Valdis Thora Jonsdottir backed up her opening round with a solid 70 and lies three shots off the lead. She said: “I played quite solid and I didn’t have a lot of trouble. I didn’t give myself as many birdie opportunities, but I made a couple of good putts for birdie and pars, so I’m happy. Fellow Australian Rebecca Artis, from Coonabarabran in New South Wales, is a stroke further back in a share of seventh place with Ines Lescudier of France and Marta Sanz Barrio from Spain. Artis already has two Ladies European Tour victories, the 2013 Helsingborg Open and 2015 Scottish Open, but she would love to collect a third in her home state this weekend. It was celebration time last night when players, volunteers, clubs, counties and coaches got together to recognise all that’s great about golf in England. About 500 guests attended the England Golf Awards 2018, sponsored by Bridgestone, and applauded the achievements which are helping to grow the game. The winners included a 23-year-old golf club captain who is helping to change the image of the game, a golf coach who is transforming lives through golf, clubs which go over and above to welcome new players and value existing members, a county which is proving that golf is modernising, volunteers who are the backbone of the game and players, led by Tommy Fleetwood, who have produced outstanding performances. Nick Pink, Chief Executive of England Golf, told guests at the Royal Lancaster London: “Tonight is a real celebration, a time to shout about all the really exciting achievements in golf. “We’ve got so much to be proud of – our finalists and winners are amazing and their stories deserve to be told far beyond the golf community. And, behind them is a whole army of volunteers, coaches, clubs and counties who are also making a huge difference. Shannon McWilliam (Aboyne), - pictured left, winner of the Border women's amateur championship in South Africa earlier in the week, stayed in good nick for the start of the South African Women's Masters - open to professionals and amateurs - at San Lameer Country Club today (Thu). She and West Linton's Gemma Batty both shot one-under-par 71s to be joint sixth behind South African professional Kim Williams, who leads by two with a four-under 68 from four players. McWilliam birdied the seventh, ninth and 12th and bogeyed the first and 14th. Batty ruined a round which included birdies at the third, sixth, 10th and 13th with a double bogey 6 at the 12th. Chloe Goadby (Stirling) is joint 14th on 73. She recovered well after going out in 40, birdieing the long 13th, short 14th and long 17th for 33 home. Hannah McCook (Grantown on Spey) finished with a 75 and a share of 24th place after running up a double bogey 6 at the sixth. She birdied two par-3 holes, the fourth and ninth. Scots professional Jane Turner from the Lothians had a disastrous round of 10-over 82, coming home in 44 shots, including a quadruple bogey 8 at the 18th. Her only birdie came at the sixth and she dropped shots at regular intervals. 70 M Bruun (Nor), J Jaxaliyeua (Kazakhstan), L Fuenfstueck (Ger), L Assad. 71 I Samu, N Diamini (Swaziland), S McWilliam (Sco) (am), G Batty (Sco) (am). 73 C Goadby (am) (T14). We all know now that #GirlsDoSport - and that more opportunities are occuring ever day to encourage more and more women and girls to particpate. However at Scottish Women in Sport, we believe it is important in order to move forward and continue to accelerate change, we take time to recognise the many female pioneers in sport who have largely gone unnoticed. Recording our sporting history is an important part of moving forward and yet there are still many pioneers who go unrecognised. This year Scottish Women in Sport will induct some of our past and present 'Pioneers of Sport' into our Hall of Fame’ on Sunday 4th March at a ladies lunch in Glasgow. Belle Robertson will be representing Women's Golf. This will be, in part, our contribution to International Women’s Day, #PressForProgress which is on Thursday 8th March. You can sign up to join us on the day. A delicious afternoon tea with a glass of prosecco on arrival, an Inspirational speaker, the awards themselves will be followed by some music. Come and join us and help us keep alive the memory of those who battled to get an opportunity to participate in sport and those who are currently leading the way. Singapore, 22 February 2018: Thai golf prodigy Atthaya ‘Jean’ Thitikul, 15, carded an even-par 71 to hold a share of the lead with 17-year-old Korean Yunji Jeong (67) after the second round of the inaugural Women’s Amateur Asia-Pacific at Sentosa Golf Club in Singapore. Koreans occupied four of the top seven places as in-form Ayean Cho (68) and Boston College star Lois Kaye Go (67) of the Philippines shared third at five-under, one ahead of Hae-ran Ryu (70), Oklahoma-based Yujeong Son (68) and Japan’s Yuna Nishimura (69). Thursday 22nd February 2018: England’s Holly Clyburn shot straight to the top of the leader board in the inaugural Australian Ladies Classic Bonville on Thursday morning. 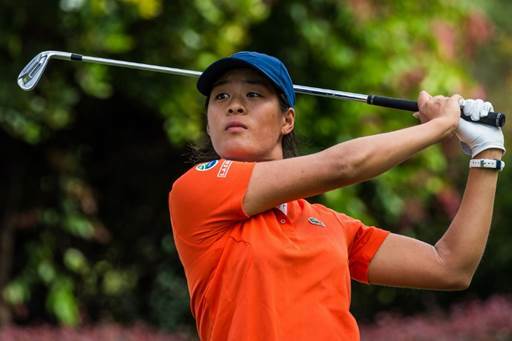 The 27-year-old from Cleethorpes had a blemish-free five-under-par 67 in warm and overcast conditions at Bonville Golf Resort, for a new course record, to end the day two strokes clear of Valdis Thora Jonsdottir from Iceland and Marta Sanz Barrio from Spain. After starting from the ninth, Clyburn birdied the 10th, 12th, fifth, sixth and seventh holes, but said it could have been even better. “It’s been nice to go and play some free golf and shoot 67, which was not very stressful. I still had 32 putts out there and hit 17 greens, so it was probably the worst I could have shot, but I wasn’t getting greedy, because it’s not an easy golf course and it can turn you upside down. 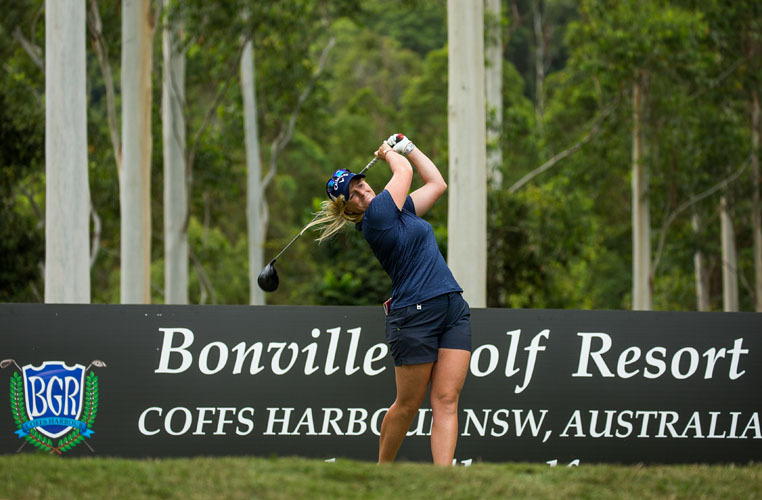 Clyburn is playing for her fourth professional title, after previous wins in the 2015 New South Wales Open, the 2013 Deloitte Ladies Open and in Spain on the LET Access Series in 2012, while Jonsdottir and Sanz are looking to become first-time winners in Bonville on the Coffs Coast. “This course is just about being patient, as you can easily lose your temper,” said Jonsdottir. Hannah Green and Steph Na were the best two Australians in an eight-way tie for fourth place on two-under-par, with Indian Sharmila Nicollet, China’s Xi Yu Lin, Nanna Koerstz Madsen from Denmark, Mexican Ana Menendez, Germany’s Olivia Cowan and Céline Boutier from France. Perth’s Green, who finished third in the Women’s Australian Open last week, birdied her last two holes and said: “I didn’t have much going on earlier in the round, but it was good to finish strongly. “The course was playing tough. There are some tricky pin positions, so you can hit a good shot and be a good 30 feet away. Indian Nicollet benefited from the local knowledge of her caddie, the former touring pro and Bonville teaching professional Richie Gallichan and she said: “Richie’s been great. He knows these greens and this course inside out, so it’s been great. It was good teamwork today. Fresh from qualifying for the China LPGA Tour after three months of intensive training in the United States, Nicollet was delighted to be in contention, but the shot of the day belonged to Belinda Ji, the 15-year-old amateur from Sydney, who made a hole-in-one using a 7-iron at the 17th. 22 February 2018 - The Carnoustie Golf Hotel & Spa was selected as ‘Runner Up’ in the category of “Best Golf Hotel” at the 2018 Prestige Hotel Awards, selected from a list of the best 100 Scottish Hotels. 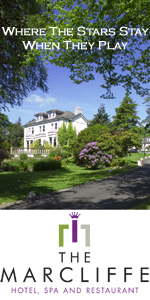 Created to showcase and reward outstanding service within the Scottish hotel industry, the awards are voted for by the public, with customer satisfaction being the sole determining factor in the results. 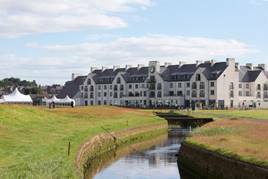 The Carnoustie Golf Hotel & Spa sits overlooking the 18th green of the Carnoustie Links, which has hosted rounds of golf dating back as far as the 16thcentury. Featuring 96 en-suite bedrooms, including ten suites with outstanding views of the course itself, the property has benefitted from a multi-million pound refurbishment over the past 3 years, encompassing all bedrooms and public areas, in anticipating of Carnoustie playing host to the 147thOpen Championship this July. 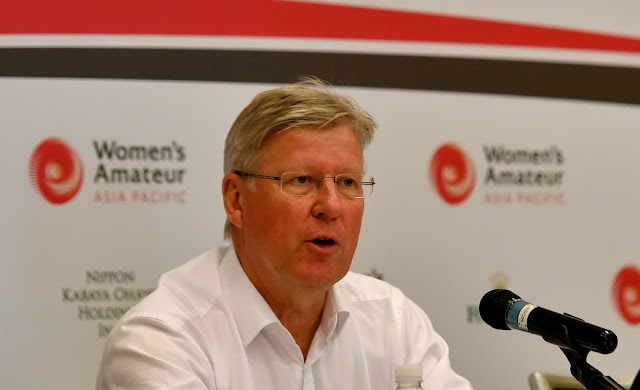 Singapore, 22 February 2018: Martin Slumbers, Chief Executive of The R&A, described the potential of the Women’s Amateur Asia-Pacific championship as “extraordinary” at a press conference featuring the championship’s Founding Partners at Sentosa Golf Club in Singapore. The Women’s Amateur Asia-Pacific was developed by the Asia-Pacific Golf Confederation (APGC) and The R&A to nurture talent and provide a pathway for Asia’s elite female amateurs to the international stage. The inaugural edition teed off at Sentosa Golf Club’s New Tanjong course on Wednesday and will conclude on Saturday. Slumbers said the annual championship, which will be held in Japan in 2019, had enormous potential and was part of an overall vision to grow the game globally and to bolster women’s and girls’ golf.